A calendar showing the month of June. 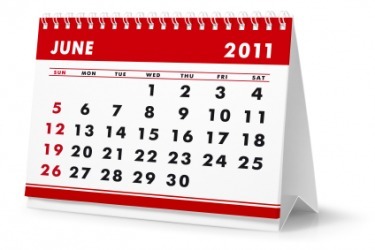 June is the sixth month of the year after May and before July. The sixth month of the year that starts after Memorial Day and that goes for thirty days is an example of June. "June." YourDictionary, n.d. Web. 20 April 2019. <https://www.yourdictionary.com/June>. Middle English from Old English Junius and from Old French juin both from Latin (mēnsis) Iūnius (month) of June from Iūnō Juno ; see Juno . From Middle English jun, june, re-Latinized from Middle English juyng, from Old French juing, from Latin iūnius, the month of the goddess Iuno (“Juno”), perhaps from Proto-Indo-European *yuwn̥kós, from *yew- (“vital force, youthful vigor”). The warm month of June melted into the scalding month of July. The cold wet days of May had thawed into the warmth of June, yet their marriage remained cold and lifeless. She didn't intend to say anything to anyone, but Katie was on her like a hen on a June bug the minute she came through the door.